Gen. C.Q. Brown, commander of Pacific Air Forces, said space is higher on the agenda than it’s been in the past. WASHINGTON — Just four months into his tour as Pacific Air Forces Commander, Gen. C.Q. Brown Jr. is quickly getting up to speed on the benefits and vulnerabilities of space systems. “This is an area that I’m actually learning a lot more about,” Brown told reporters at the Pentagon on Monday. A component of U.S. Indo-Pacific Command, Pacific Air Forces, or PACAF, is headquartered at Joint Base Pearl Harbor-Hickam, Hawaii. 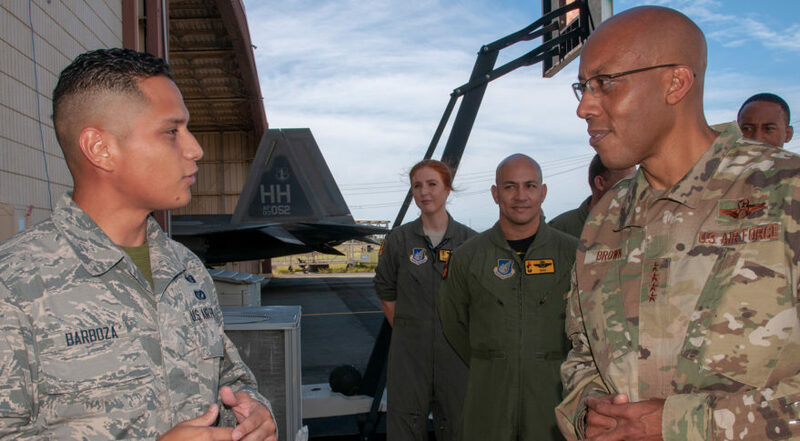 Brown commands 46,000 airmen whose primary mission is to provide air and space power in the Asia-Pacific region. Brown said his plans to prepare for future air and space warfare are being shaped by the Defense Department’s National Defense Strategy, which emphasizes military readiness for “great power competition.” For PACAF, this means, among other things, equipping and training for the possibility of a large-scale conflict in the South China Sea. More recently, he said, “We’re able to talk about space at a lower classification level.” Many of the conversations focus on the capabilities that U.S. forces need in space and also the threats posed by rising military powers like China and Russia.